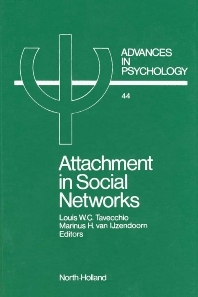 The main objective of the research presented in this book is to broaden the scope of attachment theory by stressing the importance of a social network approach to the study of attachment. This approach forms the integrating theme of this volume, as is testified by various studies of attachment as it develops in an "extended" rearing context over and beyond the limits of the traditional mother-child dyad. In this connection attention is paid to the importance of sibling relationships, attachment relationships with professional caregivers, the role of the father in caring and rearing young children, and the (short-term and long-term) effects on attachment quality of maternal employment in infancy. Also, the cross-cultural validity of Ainsworth's Strange Situation is discussed, with reference to the USA, Sweden, Israel, Japan, The Netherlands, etc. In adopting a social network approach, the attachment theory proves to be a particularly useful instrument for reflecting on the consequence of social change (maternal employment, symmetrical families, socialisation of childrearing) for child development.